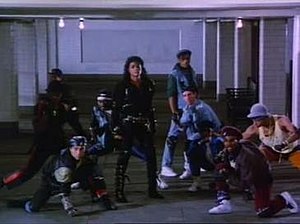 Readers of my blog know that I’m a huge fan of Michael Jackson’s song and dance. A year ago, my husband bought tickets to Cirque du Soleil‘s tribute to MJ as a Christmas present to me. Last night, the long awaited event finally arrived. When we bought the tickets online we thought we got pretty good seats. We’d sat in the same section for a Michael Buble concert a couple of years earlier. Well we were wrong. 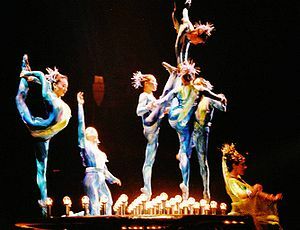 A side view of the Cirque show made it difficult, and at times impossible, to see the video presentations on the drop-down screen. Also a detraction were the visible wires hooked up to the performers’ costumes as they sailed through the air. Nose bleed seats with a frontal view might’ve been better picks had we known. But that’s just it. Choosing seats via Ticket Master is like a crap shoot. The luck of the draw is in the roll of the dice. Still we weren’t complaining. I’m sure people seated further to our right were literally in the dark as to what appeared on the screen. But judging from the murmurs swirling around us, our seats were not the big problem. Cirque du Soleil usually conjures up images of immaculate execution on the part of the artists. Save for one group of Asian acrobatic men and a high-wire couple, the remaining performers were sub-standard. I would not have expected such lackluster quality from the Cirque brand. It’s a shame because much of the staging looked expensive…not exquisite…but expensive. 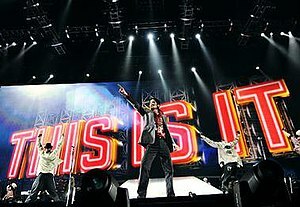 Most memorable were the gigantic video screens which were a backdrop to the show and upon which we’d glimpse MJ singing and dancing from time to time. When not displaying his or other video images, the screens reflected the performers, including the musicians and singers. Among them Michael Jackson‘s drummer of many years. He was the only person visibly connected to the late, pop icon. Not like being in his presence…but good enough for me. When Jackson died I bought every one of his dvds and cds. I’d never seen him perform live, nor had I kept up with his career since he was in his late teens. For months after his death, I became reacquainted with my one-time idol. I was mesmerized by the precision of his moves, and the amazing range of his vocals. 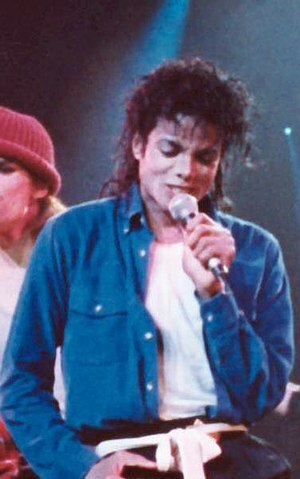 Although he was accompanied by a talented ensemble, none could match the perfection of MJ’s performances. I thought for sure Cirque du Soleil would be up to the task. I was gravely disappointed. Jackson was probably turning over in his grave as well. And not because of insomnia! Better that my ticket money had gone toward a show featuring MJ singing and dancing on those gargantuan screens, excerpts from all his videos . And rather than using so-so dancers, Cirque should have hired the hand-selected few that Jackson himself had chosen for “This is It!” Now those young guys could hold their own alongside the man himself. They were on fire! By comparison, Cirque’s crew was not as crisp, clean, or in sync. A little sloppy, in fact. My husband felt the show looked like a dress rehearsal instead of the real thing. In fact there were two unscheduled intermissions because of technical difficulties. The audience sat twiddling our thumbs for 20 minutes both times. I wondered if Cirque had attempted to do too much technical wizardry while touring. Because of the seeming half-hazard conglomeration of acts, I thought that perhaps Cirque wasn’t up to the task of creating a show worthy of the pop icon’s overwhelming talent. Having 40 minutes of empty time on my hands, I could conjecture all kinds of what ifs. The best thing about the show? The appearance of Michael Jackson…doing what he does best. Cirque du Soleil should’ve done what they do best…acrobatics…and unimagineable, magical creations. Maybe the show will measure up to Cirque’s normal high standards when it goes home…to Vegas. This entry was posted in entertainment, famous people, performing, technology and tagged acrobats, blogging, Cirque du Soleil, dancers, Michael Jackson, postaday2011. Bookmark the permalink. I wondered about that show. I like Cirque du Soleil and I like Michael Jackson, I just wasn’t sure how they would go together. I will most certainly try to remember to be on hand. Congrats ahead of time…you deserve that and more…for all your hard work. Sasha Scooter reblogged this on Sasha Scooter's Blog. Oh sweetie, I’m so sorry to hear this. The show should have been a tribute to Michael, a way to reconnect with him. And now it gave you frustration and irritation. Go on, play his CD and DVD now, let his voice take you back to that special atmosphere. Let him move you as only he can do. Hi there 🙂 It is 9 AM in Holland, blue skies, golden light and cold. All is well on this side of the globe dear. We can only live our time once, and when life needs us in other places, then we stay offline. But in our hearts and minds we stay in touch, right Hugmamma? Big hug!